Professor David Rudabiri was honoured with the David Rubadiri Sister Award for his contribution towards the promotion of poetry in Africa at a ceremony at Protea Ryalls in Blantyre on Sunday March 18, 2018. PEN Malawi has this day the Eighteenth March in the year of our Lord Two Thousand and Eighteen conferred upon David Rubadiri with PEN Malawi Sisters Award. This follows having been convinced that David Rubadiri has been a pillar in the development of Malawi poetry and a pioneer in lifting up the genre into the world arena. The evening was attended by litterateurs from Blantyre and Lilongwe and from such institutions as Chancellor College, The Polytechnic, College of Medicine of the University of Malawi, Catholic University and Blantyre International University. Most media houses were represented and the function was covered in both print and electronic media. Other ‘sisters’ who read their poetry are Linly Mayenda and Rhoda Zule, members of the PEN Malawi Centre. 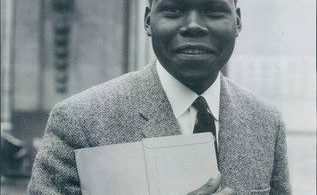 Through Penpoint, the college magazine at Makerere University, David Rubadiri made his entry into the literary world; that was in the late fifties. And from then on, he played the role of a Malawian ambassador in several anthologies. In 1963, Penguin issued Modern Poetry from Africa edited by Greald Moore and Ulli Beier, he was the sole Malawian contributor with his entry, ‘An African Thunderstorm’. In 1973, Penguin came onto the scene again with You Better Believe It, Black Verse in English from Africa, the West Indies and the United States; here too, Rubadiri represents the country with his entry ‘Thoughts after Work’. Earlier anthologies that also feature him are A book of African Verse published by Heinemann in 1964; Poetry from Africa, Pergamon Press, 1969; and Drum Beat, East African Publishing House, 1967. In 1974, David Rubadiri and David Cook co-edited Poems from East Africa. In October 1994, I received a very invaluable compliment, an anthology of poetry, Growing Up with Poetry, in which it was inscribed thus: To Alfred, with warm regards for your love of poetry. Signed—David Rubadiri. I had not met him yet because during my growing up season, he had been in exile. This 1989 Heinemann issue is a school text which he edited. At a recent conference of the African Literature Association in the US held at University of California, San Diego, those of us who are said to belong to the third generation of African writing, found ourselves boasting for being brought up on Gabriel Okara’s “Piano and Drums”, Lenrie Peters’ “In the Beginning”, Christopher Okigbo’s “Heavens Gate”, Kofi Awoonor’s “The Weaver Bird”, [and] David Rubadiri’s “An African Thunderstorm”. Professor David Rubadiri, who now lives in retirement in Mzuzu, is also accredited with one novel under the title No Bride Price.